If you remember, we had some voracious robins gobbling the strawberries a few weeks ago. To deter them, we netted all the beds. As one reader accurately pointed out, we were risking "catching" robins or other critters who might get tangled in the netting. The mesh worked beautifully to deter pests, and as it turned out, we only had one bird caught (by the toe) during the three weeks the strawberry beds were covered. I was able to extract him safely and release him without a problem. However the girls were picking strawberries a few days ago when Younger Daughter suddenly came dashing into the house for a pair of scissors. "What's wrong?" I asked. "There's a snake caught in the netting," she replied, and dashed out again. I grabbed the camera and followed. Older Daughter was chopping away pieces of the netting where the snake was caught. I sent Younger Daughter back to the house for a pair of embroidery scissors since I knew big scissors wouldn't work to extract the snake. The poor little guy had done an extremely thorough job of tangling himself up. While Older Daughter took pictures, Younger Daughter held the netting apart while I carefully -- carefully -- snipped away the mesh. It was pretty tight against the snake's scales so it was tricky work. He wrapped his tail around my hand while I worked on his upper body. Fortunately he wasn't hurt in the slightest, just entangled. The girls breathed a sigh of relief when he was free. Anyone know what kind of snake this is? Because she was concerned the snake might have gotten dehydrated during his imprisonment, Older Daughter wanted to release him by the pond, which she did. However we decided that since the June-bearing strawberries were moving past their peak, it was time to remove the netting. They girls piled it up, and I bundled it together and put it away for the year. 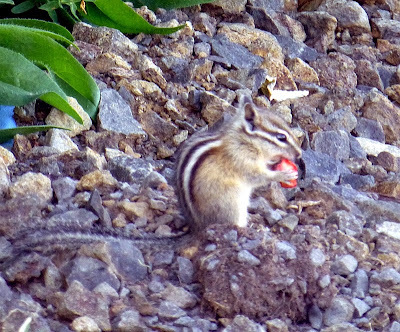 So it was the height of irony when I went out into the garden yesterday morning to do some weeding, and saw this cheeky chipmunk dashing across the gravel with a strawberry in his mouth. He paused and ate it long enough for me to take nine photos (most of them identical) before dropping his breakfast and dashing off. Ah well, I can't complain that we aren't getting enough strawberries. 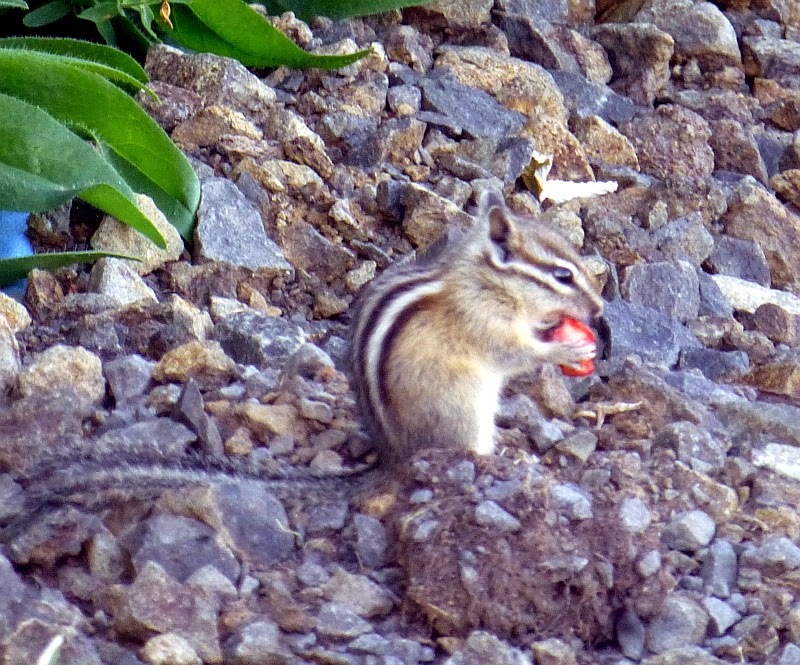 I guess I can spare one or two to the chipmunks. I love that your daughters thought the snake's well-being was important. I love the bullsnake in the barn, the gartersnakes in the backyard, the ratsnake who inhabits my roundbale of prairie hay. I intensely dislike the behavior of folks who are knee-jerk snake killers, who act through sheer ignorance and fear. The snake looked like a rat snake to me. A good guy. Try red painted rocks early in the year, before you get the first strawberries. The birds in the area will come after them, realize they aren't food, and then leave the berries alone. Added advantage that you can leave them there for next year. Doesn't help with chipmunks, etc, but effective on birds. Looks like a garter snake. Standard issue Garter Snake. Not dangerous to humans, and their venom is so weak that for years they were thought to be non-venomous. They eat any small animals they can overpower. Some folks keep them as pets, but I try to keep them in the garden, where they eat all the pests that go after my veggies. It's a garter snake of some sort...there are about 6 or 7 specific species it could be...any of them would appreciate being let go back in the pond area. The snake looks like a garter snake (there are two in Idaho). It may have been looking for a meal that had hidden itself in the berry plants or some shelter from the never ending heat! Awww! Snake-savers extraordinaire! A touching story. Thank you for telling it. It made me happy. My 11 year old daughter looked at it and said it was a rat snake.